Alex Munter is the Chair of the Ottawa Local Immigration Partnership Council, where he presides over multi-sectoral collaborations through a community-wide governance process aimed at building Ottawa’s capacity to attract, settle, and integrate immigrants. 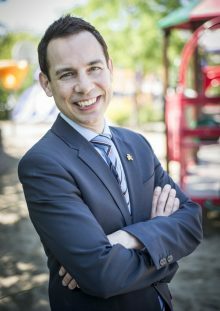 Alex Munter is President and Chief Executive Officer of the Children’s Hospital of Eastern Ontario, bringing more than 20 years of leadership experience in health and social services realm. Alex was Chief Executive Officer of the Champlain Local Health Integration Network — the provincial government agency responsible for planning, integrating and funding health services in the region. He strengthened the region’s health system by making strategic investments at hospitals and community-based agencies in all areas of our region. As Executive Director of the Youth Services Bureau, Alex grew the organization, adding services and expanding its reach. It won recognition for its ground-breaking work in addressing youth mental health issues and introducing measures to improve the agency’s governance, efficiency and service quality. Prior to taking the three CEO roles in which he has served, Alex was a City and Regional Councillor in Ottawa for 12 years, including six as head of the city’s health and social services. Alex has won numerous awards from a wide range of organizations for his contributions to the community and is a proud member of the Canadian College of Health Leaders.